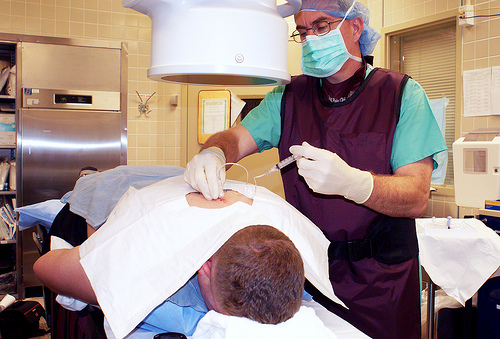 An epidural steroid injection (ESI), also known as a block, is a non-surgical pain management technique which delivers a local anesthetic directly into the spine. Doing so has been said to help reduce the inflammation inside of the spine, helping to reduce the pain and even helping treat conditions such as spinal stenosis, herniated disc or degenerative disc disease, to name a few. In most cases, this injection is often recommended so that the patient can start physical therapy or some sort of rehab to exercise with limited pain. Becoming an increasingly popular way to help reduce back pain, the FDA has not approved this sort of procedure and is only considered as a short-term relief option. How much does an epidural steroid injection cost? The average cost of an epidural steroid injection will all depend on your health insurance, your geographical location, the provider and the facility where it’s performed. Without insurance, the averages, from prices previous patients shared online, ranged anywhere from $780 to more than $1,900 for just the epidural steroid injection. If a contrast dye is administered during the procedure, this can increase the costs as well. In some cases, your doctor may want to confirm your back pain with a CT scan, MRI and/or x-ray to see if the injections may work for your circumstances. If this were the case, then you would have to budget for these procedures before the injections are even considered. At MDSave.com, for instance, the providers listed on their website averaged $909 for the procedure. Art Caplan, Ph.d. at NBC News noted the average epidural steroid injection can cost $600 per shot. According to BottomLineINC.com, the average injection can cost anywhere between $600 and $2,500 each and will not be helpful for back pain caused by muscle spasms. They also mention most medical professionals discourage these injections unless you had symptoms for more than six weeks. The injection, given by an anesthesiologist or an interventional radiologist, is often done inside of a specialty clinic, hospital or doctors’ office. Before the injection begins, you will lay flat on an x-ray table with your back slightly curved. If this position causes any pain, then you may be able to sit in a different position. During the injection, an x-ray, known as a fluoroscopy, will be used to help guide the placement of the local anesthetic into the epidural space — the area between the vertebrae and the spinal cord. This injection is designed to help reduce any inflammation in this area. This is important as studies have found, without this guidance, the medication may be misplaced. When the needle is in the appropriate position, a contrast is injected to confirm the location and the steroid solution is then injected, ranging from 3 to 10mL, depending on the approach and steroid being used. The entire procedure will take less than a half hour and after the procedure is done, you will be asked to sit in the waiting room for up to an hour, depending on if a sedative was used or not. When returning home on the day of the procedure, your doctor will ask that you rest for up to 24 hours before resuming the usual activities. This injection, depending on the reasoning, can be performed up to three times in 180 days. If you do not feel relief, even after multiple injections, then your doctor will recommend another course of action. As the benefits only last a few weeks, additional injections may only be recommended based on your doctor’s approval. If performed on a patient experiencing limited lower back pain, some can see short-term relief for as long as six weeks on average. While the injections are deemed relatively safe, some risks may occur, including an inflammation of the lining of the spinal cord, meningitis, damage to the spinal cord, nerve injury and/or paralysis. Some rarer but serious risks may include headaches, back pain, dizziness, urinary retention, incontinence, facial flushing, increased pain, vomiting or pain at the injection site. Even though they are considered safe for the majority who have them, the most common side effects, as per PainDoctor.com, can include pain, bleed and/or swelling at the injection site. Other side effects include nausea, weight gain, diarrhea, hot flashes, anxiety, water retention and changes in your blood pressure. We recommend reading this Johns Hopkins side effect list for more information as to what to expect. The American Pain Society, the American Society of Interventional Pain Physicians, and the American Academy of Neurology, as per Consumer Reports, noted, that with some evidence, these types of shots can help ease lower back pain caused by nerve pain in the short-term; however, these shots will not provide any long-term benefits. A neurology group, for instance, stated these shots had no impact on their functional impairment, the need for surgery or pain relief beyond 90 days. Also, according to the article, a review of medical studies determined that there is insufficient benefits to support the use of any injection therapy for lower back pain. Doctors often recommend first trying other noninvasive measures such as physical therapy, medication, hot/cold compresses, acupuncture, massages and/or manipulation before attempting an injection, especially if this is the first time seeking relief for your lower back pain. While many medical professionals do not advise against this type of therapy, they recommend it as a last resort if other noninvasive methods are not working for your situation. Always discuss your health with your doctor ahead of time as many will not perform the procedure if you have an infection, uncontrollable diabetes and/or are on blood thinners. Other medical conditions may prevent you from receiving the injections as well, so it’s best to talk with your physician to know if you are a candidate. Consumer Reports says you should always ask your doctor if they are a board-certified pain specialist. This simply means they have done a formal fellowship in pain management. After the treatment, the results greatly vary on your circumstances. Some people report relief in as little as two to three days, while others state it can take more than two weeks to see progress. Emory Health has a helpful PDF in regards to what you should expect after the procedure is complete. These injections can stay in your system for about three to four weeks.